The force-vector theory has been popularised by Bret Contreras and may have stemmed from Verkhoshanky’s proposals of dynamic correspondence. How does Force-Vector training work? The force-vector theory has been popularised by Bret Contreras and may have stemmed from Verkhoshanky’s proposals of dynamic correspondence. The force-vector theory allows coaches to identify training exercises (e.g. back squat) which may have greater specificity to the competition movements (e.g. sprinting). Research has observed greater improvements in both horizontal and vertical sporting movements after performing training exercises in the same direction. Traditional strength and power training may have minimal transfer to sporting performance in experienced and advanced athletes, therefore, utilising specific exercises that match the force-vector may be a more effective way to enhance sporting performance. 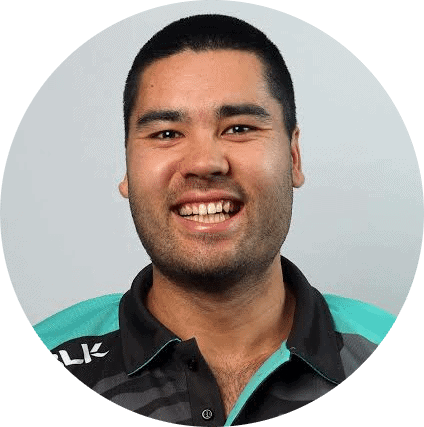 Force-vector training has recently been popularised by the work of Bret Contreras, and it involves characterising movement by the direction of the resistance. In theory, by using training exercises in the same force-vector as the sport-specific movement, it is believed that there will be a greater training transfer effect. Originally, the force-vector theory may have stemmed from Verkhoshanky’s dynamic correspondence (read more about that HERE). Essentially, dynamic correspondence refers to increasing the working effect of the key movements of competition exercise through exercises that closely conform to the sporting movement (i.e. the training transfer effect). The working effect refers to increasing the maximal amount of force produced in a limited, or short time frame , and is otherwise known as the rate of force development. Muscle groups of the training exercise must be the same as the competition exercise. Range of motion and the direction of movement of the training exercise must be the same as the competition exercise. Force-vector training, therefore, allows coaches to identify training exercises that have greater specificity to the competition movements. For example, Contreras et al. states that the since the hip thrust is performed in the anteroposterior force-vector (front to back), then it may have better transference to sports dependent upon horizontal force production (e.g. rugby, sprinting, football), as the horizontal force-vectors are anteroposterior when standing. In contrast, the squat may have a stronger transfer to the vertical jump due to its axial force-vector (top to bottom). In two recent studies which examined the impact of force-vector training on athletic performance, both found greater improvements in the horizontal-orientated movements (sprinting and broad jumping) when training exercises were focussed on horizontal force-vectors [3, 4]. Likewise, greater improvements in the vertical-orientated movements (vertical jump) were observed when the training exercises were focussed on vertical force-vectors [3, 4]. Similarly, Contreras et al. found a hip thrust group (horizontal-orientated exercise) made greater improvements in the standing broad jump, 10m and 20m sprint test (horizontal-orientated movements), compared to a front squat group (vertical-orientated exercise), who, in fact, showed greater improvements in vertical jump (vertical-orientated movements). Collectively, the findings from these studies support the force-vector theory. To understand the principle component of force-vector training, one must fully understand the ratio of force. The ratio of force is seen as ‘force application technique’, and is independent from the total force being applied . In other words, it describes how the vertical and horizontal forces are being applied to the ground during sprinting. However, it only looks at it as a percentage, with no regards to the total force value. Generally, the ratio of force values ranges from 50-65% in most locomotive athletes. Morin et al. states that a positive acceleration in the forward direction will result from a positive value of the net horizontal force (greater propulsive forces than braking forces). In addition, it has been observed that the strongest predictor of sprint velocity (measured at 16m) was relative horizontal impulse, accounting for 61% . It has also been observed that the gluteus maximus to quadriceps femoris muscle volume ratio can explain 23.4% of the variability in 100m sprint performance . Essentially, a larger gluteus maximus compared with quadriceps may aid in accelerating hip extension and producing greater propulsive forces . Research has observed significant, strong correlations between horizontal force and index of force application* with maximal speed, 100m performance, and 4-second distance while vertical force was only correlated with maximal speed . Another paper observed that sprint athletes who ‘push more’ when sprinting, appear to have faster 40m sprint times . Finally, de Lacey et al. showed elite rugby league backs were faster than their forward counterparts, and that the backs produced greater relative horizontal force and power, while vertical force showed no significant difference. *The index of force application represents a decrement in the ratio of force with increasing running velocity . Being able to produce high-levels of horizontal force at high velocities is one key to sprint speed. Athletes are often encouraged to focus their attention on improving their squat, deadlift, and/or power clean in order to become a better athlete. However, these exercises are all axially-loaded (top to bottom) as per the force-vector theory. Many sports are played in multiple force-vectors, therefore, focussing solely on these three axially-loaded exercises may mean the athlete is not getting sufficient stimuli to optimise performance. In addition, training in multiple force-vectors may be essential for reducing the risk of injury. Brughelli et al. concluded that traditional strength and power training mostly failed to elicit improvements in change of direction performance. Instead, using exercises that mimic the demands of change of direction more closely, such as lateral jump training, have shown to be effective at improving change of direction performance . Furthermore, traditional strength and power training may have minimal transfer to sporting performance in experienced and advanced athletes, where maximising transfer should be as specific as possible in regards to movement pattern and contraction velocity . 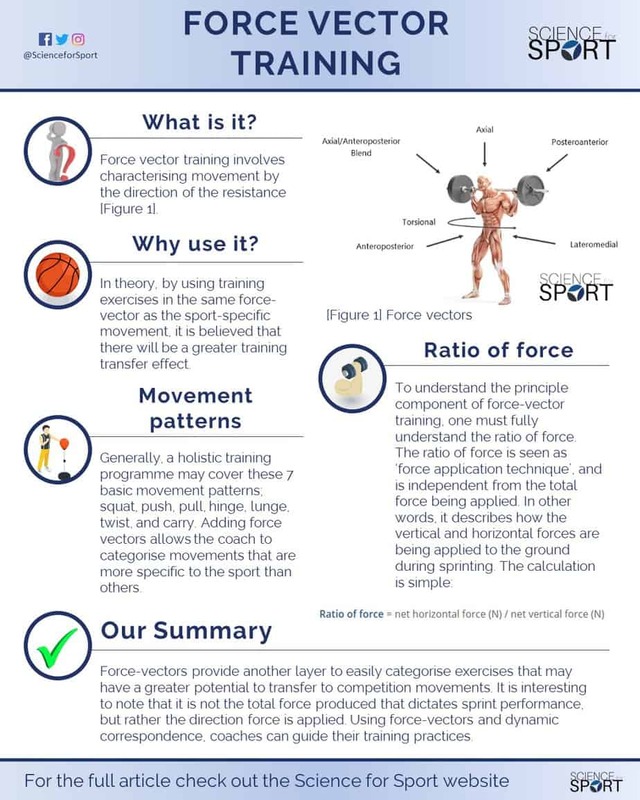 A coach armed with the knowledge of force-vectors and the demands of their sport means programming can be evaluated not just by covering these movement patterns, but by making sure the required force-vectors for the sport are also considered. In essence, this allows the coach to categorise movements that are more specific for the sport than others. From there, utilising the principles of dynamic correspondence can help identify or create exercises that are most specific to the athlete’s competition movements. The end goal is to have exercises that have a high likelihood of transferring to the sporting arena. The long-term effects (using interventions of longer than 12-weeks) of performing a specific force-vector exercise on movements in that same force-vector. How force-vector training transfers to certain sport-specific movements such as the ability to sidestep or cut. How long-term training of a specific force-vector may hinder or enhance performance in another force-vector. Examining specific exercises to determine their ratio of force. Force-vectors provide another layer to easily categorise exercises that may have a greater potential to transfer to competition movements. It is interesting to note that it is not the total force produced that dictates sprint performance, but rather the direction force is applied. With this in mind, training studies seem to mimic this idea where training horizontal-orientated exercises show a greater effect during horizontal-orientated movements, such as sprinting. This is possibly due to training the ‘force application technique’, where a greater magnitude of force can be orientated in the forward direction. Through understanding force-vectors and dynamic correspondence, coaches can use this information to guide their training practices. Strength and conditioning entails many, many topics. 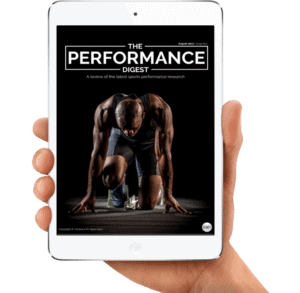 By choosing to simply read up on Force-Vector Training and ignore the sea of other crucial S&C topics, you run the risk of being detrimental to your athlete’s success and not realising your full potential. To make you an expert coach and make your life as easy as possible, we highly suggest you now check out this article on Dynamic Correspondence.